Dutch physicist, mathematician and philosopher, one of the first proponents of Newton on the Continent. 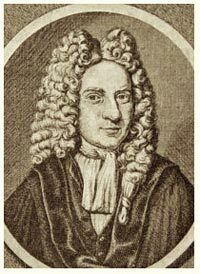 Professor of mathematics and astronomy, later also professor of philosophy, at Leiden university; member of the Royal Society. Main works: Physices elementa mathematica, experimentis confirmata. Sive introductio ad philosophiam Newtonianam (Leiden 1720-1721); Introductio ad philosophiam, metaphysicam et logicam continens (Leiden 1736); Oeuvres philosophiques et mathématiques de Mr. G.J. ’s Gravesande, ed. J.N.S. Allamand, 2 vol. (Amsterdam 1774). 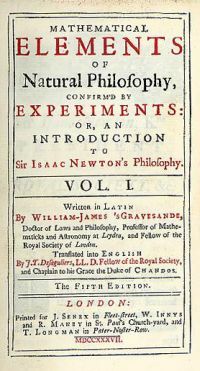 Bibliography: G. Gori, La fondazione dell’esperienza in ’s Gravesande (Firenze 1972); Paul Schuurman, Willem Jacob ’s Gravesande’s Philosophical Defence of Newtonianism (1736), in Ideas, Mental Faculties and Method. The Logic of Ideas of Descartes and Locke and its Reception in the Dutch Republic 1630-1750 (Leiden 2004) pp. 129-155. Bibliotheca 's Gravesandiana. Sive catalogus librorum bibliothecae selectissimae viri clarissimi D. Gul. Jac. 's Gravesande, dum in vivis esset A.L.M. J.U. & Ph. D. philosophiae matheseos & astronomiae professoris in academia Lugduno-Batava, Societatis Regiae Scientiarum Londinensis Socii. Nullis aliorum libris intermixtis. Quorum publica fiet auctio in officina Joh. & Herm. Verbeek, die Lunae 24 Septembris & seqq. diebus 1742, Lugdini Batavorum, apud J. & H. Verbeek 1742. The sale catalogue, drawn up after the death of 's Gravesande, lists 1352 consequetively numbered items, divided by topic and format; followed by three defended titles, including two works by Spinoza; followed by ‘Verscheide Pakketten’ (=‘Various parcels’) of orations, disputations, poems and various books; followed by a list of maps and atlases; followed by a list of mathematical instruments.